Kicking things off was Finn Balor vs. Tyler Breeze in a very strong opener that started out methodical and built to some crazy high spots. Near the end Balor disappeared outside the ring before attacking Breeze on the ramp. He then dove off the Titantron, rolled Breeze back into the ring, and finished him with the Coup de Grace. Solid match. Unstoppable marked the first time an NXT special featured two women's matches. Charlotte & Bayley vs. Emma & Dana Brooke amounted to a pretty good, fast-paced tag match. Charlotte and Bayley played the uneasy allies who stayed professional enough to get the job done. Nothing amazing but a good undercard match. A surprise hit for me, Rhyno vs. Baron Corbin was a surprisingly effective brawl that never dragged. Rhyno was the first veteran brought in to NXT to lend the brand some credibility, and he did a fine job of making Corbin look strong while still getting in his stuff. Not bad at all. The Tag Titles were next as Blake & Murphy faced Enzo & Cass in an entertaining tag match. Enzo had his working shoes on, doing most of the bumping around before making the hot tag to Cass. The ending was a tad overbooked with Carmella and Alexa Bliss fighting outside. Alexa would then dump an exhausted Enzo off the top rope to be pinned. I said earlier that Unstoppable was the first NXT special with multiple women's matches, and it also began the trend of the Women's Division truly upstaging the men. Sasha Banks vs. Becky Lynch was a match full of excellent psychology and mat-based wrestling. The two traded classic grappling holds and each worked the other's arm throughout. Sasha even broke out some Bryan Danielson-style stretch moves that looked excruciating. Near the end Becky came back, assaulted Sasha's arm and applied her armbar finisher before Sasha made the ropes. Sasha countered a top-rope move with a vicious-looking armbreaker from the top and applied the Bank Statement for the win. Banks established herself here as THE woman to beat in NXT, but she and her next challenger would write a new chapter for women's wrestling at the next two TakeOvers. The Kevin Owens-Sami Zayn NXT Title rematch was hindered a bit by Zayn's shoulder injury from RAW against John Cena, but I'll be damned if they didn't throw together a nice little 13-minute fight. Zayn stayed one step ahead of Owens the entire match, making it look like he might do the impossible. The action spilled to the outside, where Owens caught Zayn in a powerbomb on the apron, and the match was called a no-contest from there. Officials hovered around Zayn but Owens continued his attack until even William Regal came out to stop him. Owens hit Regal with a headbutt, and then the big closing moment of the show - Samoa Joe made his NXT debut to stare down Owens! All-in-all, while not a great show, Unstoppable featured one excellent match and several decent ones, and ended with arguably the biggest moment in the brand's young history at that point. 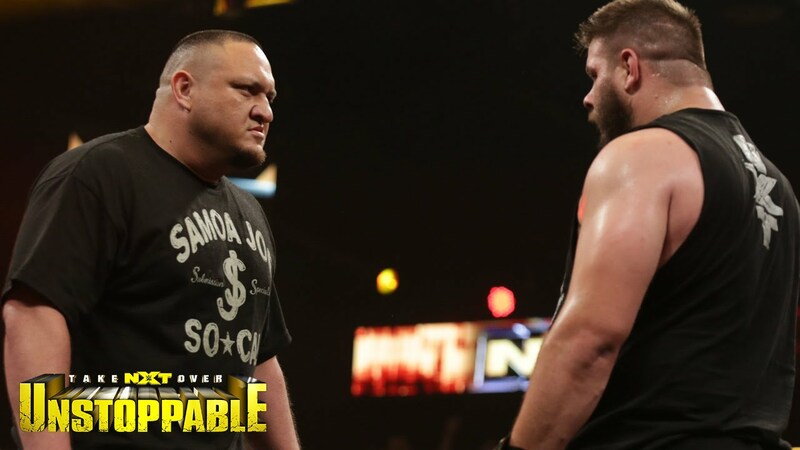 Samoa Joe would be the first of several non-WWE veterans to show up on NXT under their original names, thus partially reversing WWE's inane policy of forcing all signees to pick a trademarkable name. Anywho, solid show.